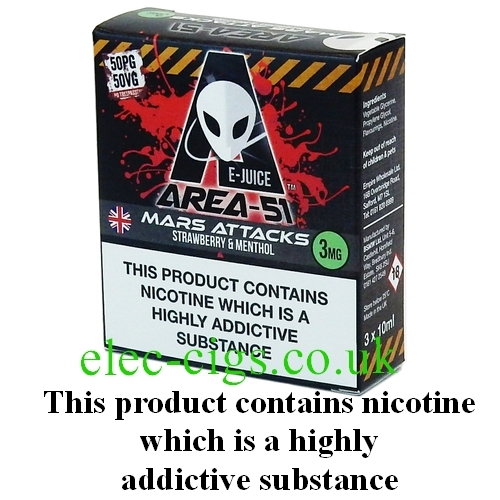 Area 51: Mars Attacks E-Juice is a Strawberry and Menthol Mix. Ripe sweet Strawberries with an Icy blast of Menthol makes this a perfect combination. Area 51: Mars Attacks E-Juice is just one of 9 awesome flavours in the range. It is beautifully balanced at 50/50 (PG/VG) so it can be used in any type of vaping device. it comes in 3 x 10 ml plastic bottles with a child-resistant caps. It is crafted with care in the UK and is Diacetyl Free and Acetyl Propionyl Free. It is available in three nicotine strengths: 3 mg, 6 mg and 12 mg. So if you just want to have a good vape or go cloud chasing this is the perfect e-juice for you. Area 51: Mars Attacks E-Juice​ is available for sale to persons of 18 years of age or older. This product contains nicotine which is a highly addictive substance.